"Sometimes spaghetti just likes to be alone!" "what about the meatball? Does the meatball ever like to be alone?" And thus, this meatball challenge was born. We decided to explore unique ways to serve the meatball on its own - without its commonly paired up partner - spaghetti - or any pasta, for that matter. And so, here you have two dishes that involve meatballs in two similar, yet very different ways. Which one looks better? YOU decide. Don't forget to vote in the poll on the sidebar of this or the Cucina Domenico blog! Here, (out West, that is) we have more than just sunshine and the Pacific - we have a fabulous restaurant chain, "The California Pizza Kitchen!" Now, I'm sure many of you Easterners have tried this place, but have you ever ordered their pizza salad? I grew up eating at this place. While my brother & I ordered greasy pepperoni, or barbeque chicken pizza, my mom (the constant dieter) would order this pizza salad. This, my friends, is the dish that inspired The Meatball Ring. CPK would often serve a specialty salad atop a blindy baked (cooked with no toppings) pizza crust. It was like getting some bread on the side of your salad, but it made for a very unique presentation. I thought, why not incorporate meatballs into this. My mind whirled around stuffed crust pizzas - why not stuff the crust with meatballs? But that looked a bit ridiculous in my head. Then I thought about wrapping the meatballs, instead of hiding them in the crust. (Think pigs in a blanket). Eureka. That - with a little bit of help from my best friend (google), brought the meatball ring to life. And there are SO many directions you can go with this. I used croissant dough, but I am pretty sure that pizza dough, rolled out thin enough, would work just fine (maybe even better). I laid out the dough on a circular pizza pan, leaving the triangular tips around the edge in the shape of a ring. I rolled a meatball under each point of dough until I had a star-like pizza crust. I baked it according to package directions. Then, I let it cool, and topped it with a fresh salad. it was such a fun way of serving up a big salad to a crown. Then with every scoop of salad, each person can pull apart one of the triangles holding meatball. Not a bad idea, right? But then my mind went a-whirling again. Why not use this meatball ring as a way to serve up ANYTHING at all. My next thought was antipasto. PERFECT. The gorgeous layout of Italian meats, cheeses, olives, artichokes,and whatever else you like on your antipasto platter would look beautiful served atop this meatball ring. And once it's cooled, it holds together like a gem! Needless to say, this was my Superbowl party recipe! I will surely post a picture of the antipasto version a.s.a.p. - but use your imagination. What would you top this meatball ring with? To me, there is no other dish as traditional and tasty as a plate of pasta topped with two or three meatballs. Even when Sunday dinners are presented family style, the full serving plate of meatballs almost serves as the centerpiece of the table. Classic. Comforting. But I also love me a good meatball sandwich! Served up in a nice roll, topped with Parmesan and maybe a little mozzarella, toasted up in the oven grinder-style...it's crispy hot goodness in every bite! If you've read my previous posts, you know that one of our go-to foods when getting together with friends is homemade Stromboli. Using meatball as Stromboli filling is always high on our request list. The consistency of a meatball sandwich combined with the taste of delicious homemade pizza dough. How could you go wrong? The recipe itself is fairly simple – roll out your dough, top with meatballs, add some cheese, roll up, bake and serve. It's during the actual assembly when the love and craftsmanship comes into play. A. you want to make sure that you roll out your dough thin enough to fold, but not too thin where it will break. There's a lot more texture in this filling as opposed to a pepperoni or ham Stromboli, so you need enough dough to keep everything contained. 2 - if the meat is still hot, it will start to warm up the dough and make it harder to work with. C. do not go overboard when adding your gravy/sauce.The key to a meatball Stromboli is the gravy....you don't want it to be dry. A nice little drizzle of sauce on top of the crushed meatball is plenty. Too much sauce will make the dough soggy and hard to work with. And just as I mentioned about working with the meatballs cooled, you don't want the gravy to be too hot. Otherwise it will make the dough difficult to work with, You can always serve up a bowl of gravy/sauce on the side for dipping. D. try using a combination of provolone and mozzarella cheese. Both melt well, and the combination gives you an equal balance of mozzarella creaminess and provolone sharpness. This is one of the many cooking tricks that my cousin Michael taught me many years ago! 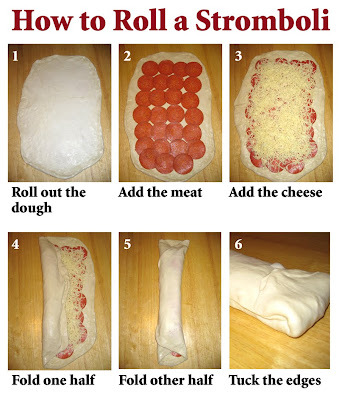 You can follow my example photo on how to roll a Stromboli (although the example photo is of a pepperoni stromboli, the same rolling method applies to the meatball stromboli). Add a few slits on the top of the dough to avoid air bubbles. Give it a quick hit with cooking spray, top with a bit of Italian seasoning. Bake uncovered at 375º for about 20-25 minutes or until crust is golden brown. Remove from oven and let it sit for 5 minutes to cool. Otherwise the insides will run out if you slice it too soon. Oh to have steady access to a California Pizza Kitchen... but we always order the BBQ Chicken chopped salad; hopefully I'll remember this posting next time I visit a CPK. The Meat Ball ring looks intriguing; but no recipe for meatballs?. We are also big fans of Big Night - we even made Timpano one year using the movie and the internet for ideas. timpano is such a fun dish! it's everything and the kitchen sink! i've got an old meatball recipe on here somewhere if yous earch the recipes link, but i've made some updates since then....looks like a meatball recipe is due shortly! Thanks for the comment, enjoy a pizza salad at cpk for me, and don't forget to vote! NEW: The Meatball Challenge Champion! Meatball Stew and Italian Herb BEER BREAD!